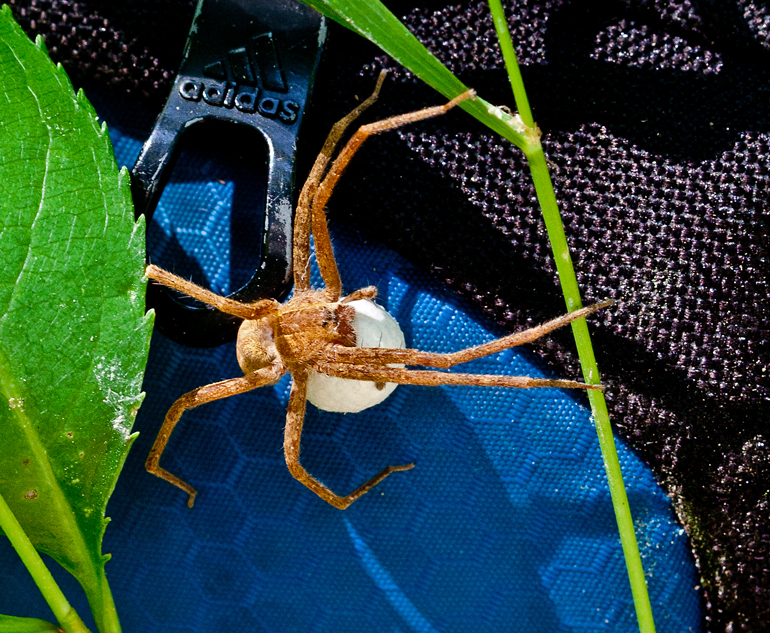 As I was reaching for my camera bag after taking a photo of a spider, I was surprised to see an unexpected visitor—a much larger spider with what looks like an egg sack. I was in a wooded area and had placed my bag on the ground while I set up my tripod to take a photo of a small spider (shown in the second photo). After getting the shots, I returned to my bag. I bent down to open the zipper of the bag and suddenly was eye-to-eye with the spider. The spider seemed really large at that moment, although retrospectively it does not seem that big when I compare it with the Adidas logo on the zipper pull. When I tried to adjust the bag’s position, the spider moved away, but fortunately I had the foresight to take some photos before attempting to improve the lighting situation. I am not sure of the identification of either of these spiders, but find them both to be pretty cool in their own ways. I’d welcome some more information from more knowledgeable readers about the white ball and, in particular, if it is an egg sack. UPDATE: I have done a little research and think that the spider in the first shot may be a Nursery Web Spider (Psaurina mira), a spider that is known for carrying its egg sack with its fangs. 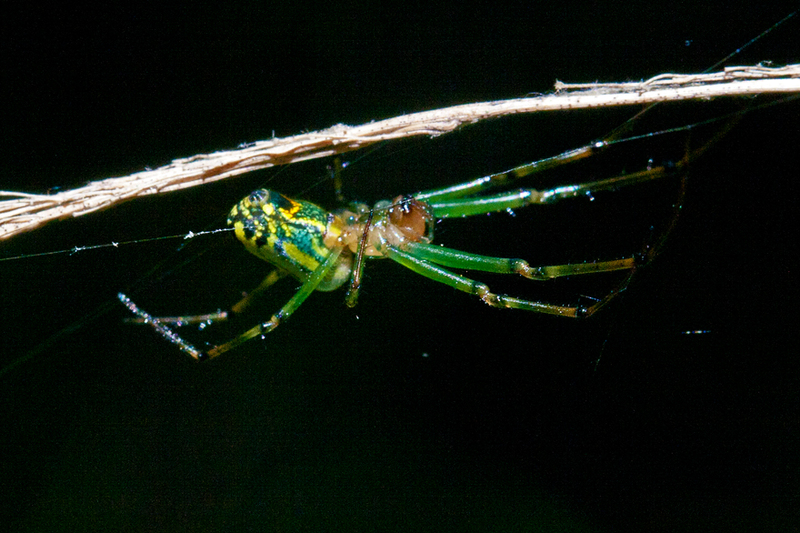 Some other spiders attach the egg sack to their spinnerets. 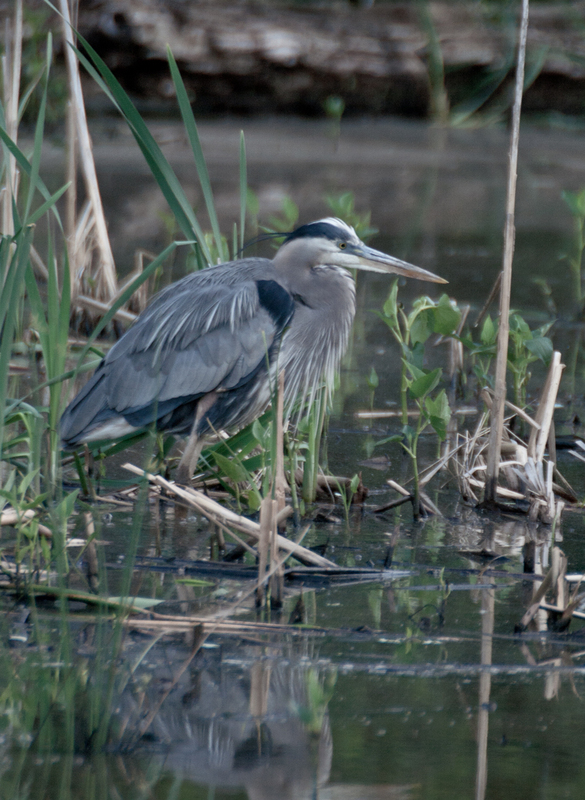 A Great Blue Heron (Ardea herodias) seems to be a regular visitor to the beaver pond at my local marsh (and may have taken up residence nearby), but usually fishes in an area in which it is tough to get a clear shot. One recent morning, however, I was happy to see him in a closer area and was able to get these shots. 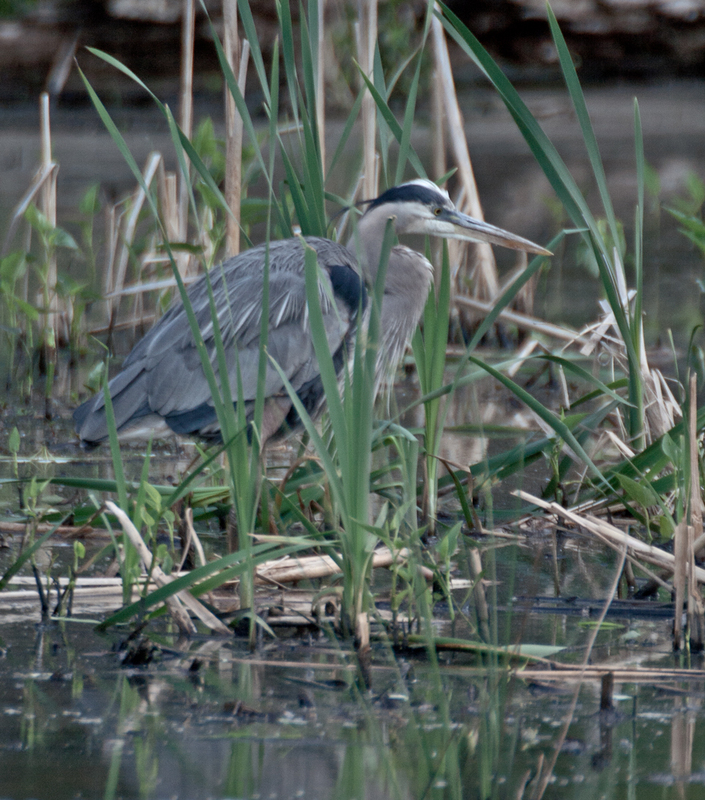 The first one has a less cluttered background, which helps to highlight the heron’s head. Sometimes, though, I like the second one better, in which the heron is tucked into the midst of the growth and is partially camouflaged. Do you have a preference for one of the two images? 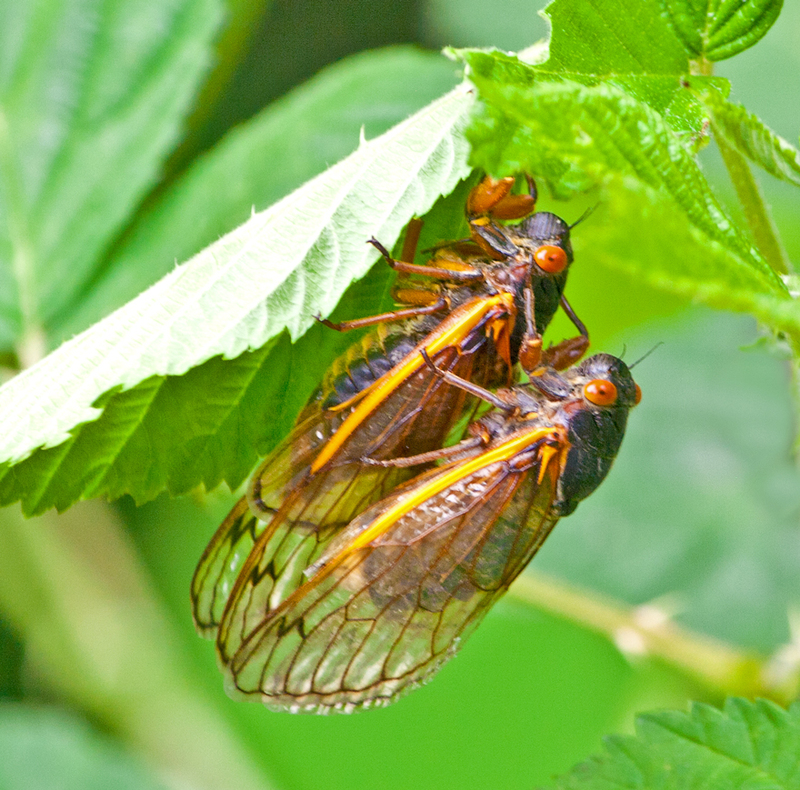 After spending most of their lives underground as nymphs, the 17 year cicadas (Magicicada septendecim) spend the few weeks of their adult lives looking for love. The males are very loud in their “singing” as they seek to attract females. I watched one cicada couple go through a very brief introduction and courtship phase and then suddenly they were mating. I guess that you have to move quickly when your days are numbered. 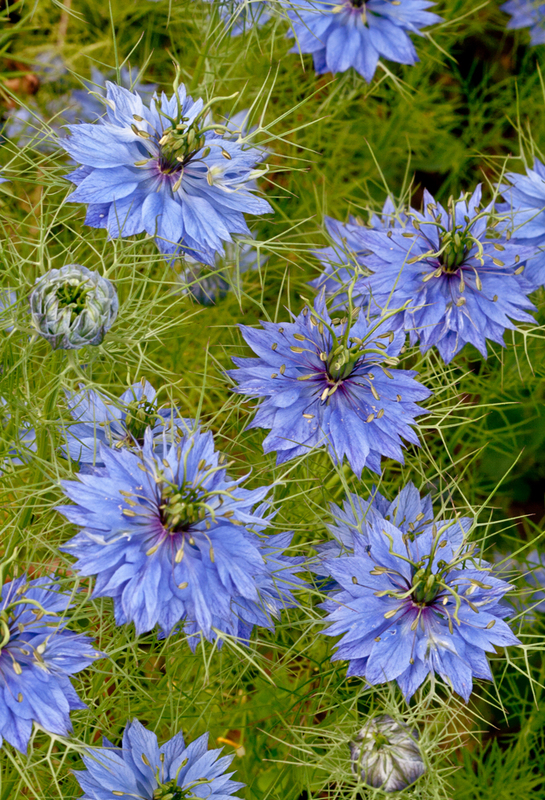 This cluster of Love-in-a-mist (Nigella damascena), one of my favorite flowers, was so striking that I decided to try to capture the grouping, even though usually when I take photos of flowers, I focus on a single blossom. Framing the shot was a challenge, as I struggled to find a plane and camera settings that would keep most of the flowers in focus. I’m pretty happy with the result and I did only a slight amount of cropping to get this final image. I grew up in the era of what is known now as classic rock-and-roll and it seemed natural to borrow the title of a Led Zeppelin song for this posting. I can’t say that I remember too many of the lyrics, excepted the chorus of repeated “Wanna whole lotta love,” but some of the guitar playing was really memorable. Click on the photo for a higher resolution view. From a distance, I couldn’t tell why the stems of this plant were bright red in color, but when I got closer, I realized it was covered in little red insects. 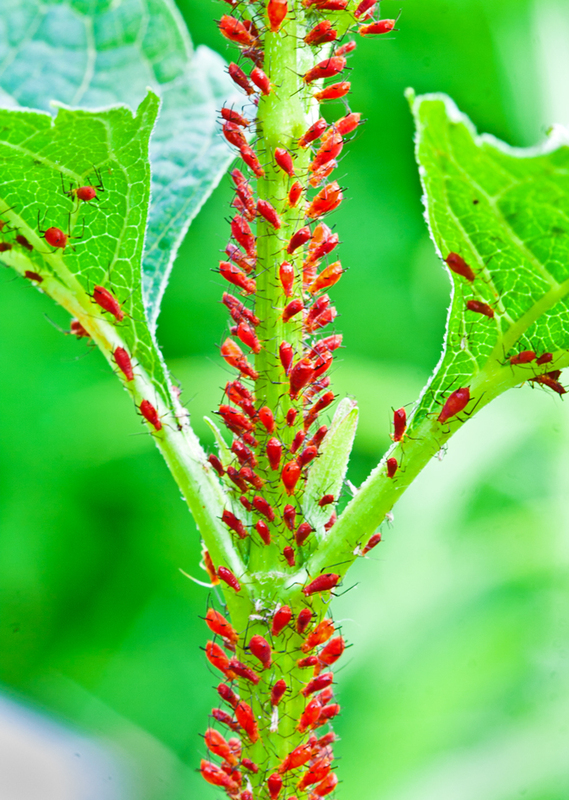 I think that these might be aphids, but I am not completely sure. There were ladybugs in some nearby plants, and if these are in fact aphids, the ladybugs may be in for a feast. Does anyone have a better idea what kind of insects these are? What do you get when you place two six year old boys in an outdoor environment filled with cicadas? You get a whole lot of energy and excitement. One of the boys came running up to me with a cicada perched on his fingertip and almost desperately asked me to take his picture. How could I refuse a request like that? 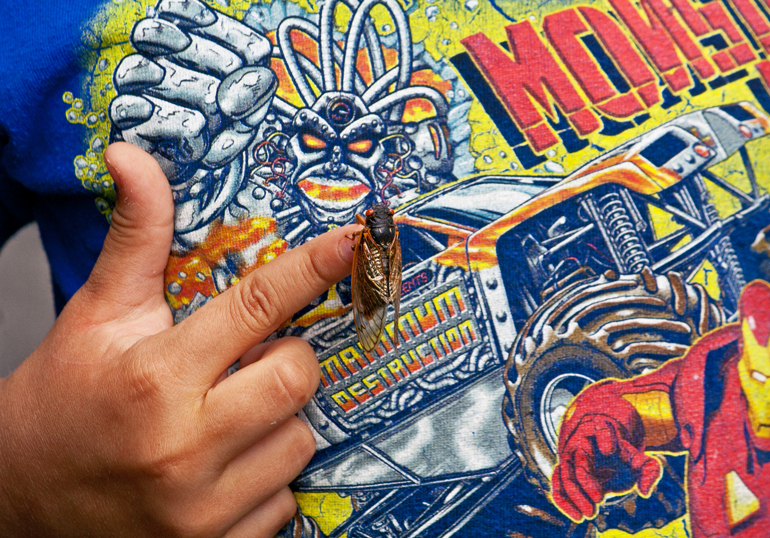 I decided that the best backdrop for the cicada was the colorful t-shirt that he was wearing. I am not sure exactly what was displayed on the shirt, but it seemed to be some sort of monsters and superheroes, which somehow seemed to be appropriate. Be sure to click on the photo to get a higher resolution of the cicada, which is a really cool-looking insect (in a slightly creepy way). It may be hard for this snapping turtle to climb the ladder of success, when he had such difficulties merely getting himself onto a floating log. 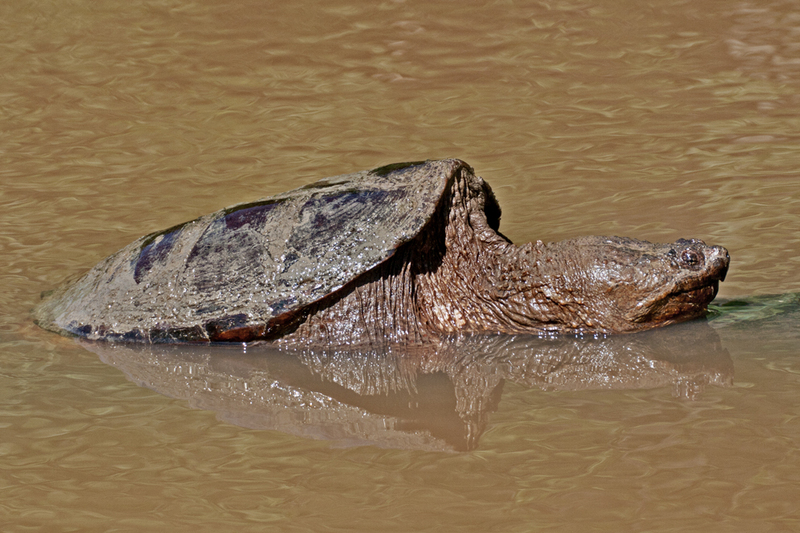 It would be understatement to note that Eastern Snapping Turtles (Chelydra serpentina serpentina) are not exactly graceful when they pull themselves out of the water (and even in the water, they seem a bit clumsy). 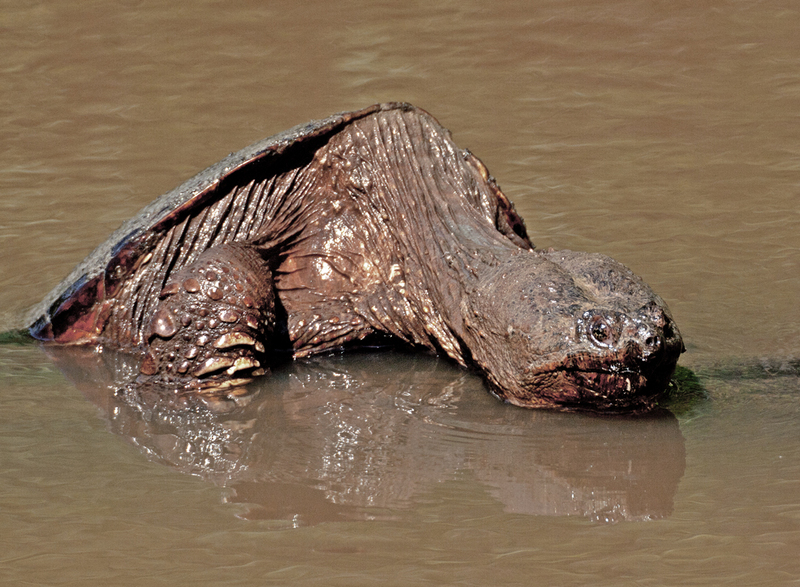 I read somewhere on-line that snapping turtles—unlike most other turtles—generally do not bask in the sun out of the water. Therefore, I was a little surprised when this turtle swam up to the log and began his attempt to climb onto it. It was like watching a movie in slow motion as he struggled and strained to pull his body up out of the water. The first image shows him taking a break after making it halfway to his goal. I love the details of his visible front leg and all of his wrinkles. In the second shot, he has achieved his objective and seems to be settling in for an afternoon nap in the sun. I noted that the log is no longer floating out of the water as it was at the start.—apparently success weighs heavy on the victor.